Need iPhone 4s repairs Melbourne CBD? The iPhone 4s is a great little phone, but unfortunately it can break easily. You don't have to shell out an arm and a leg every time you get caught in the rain or drop your iPhone 4s. 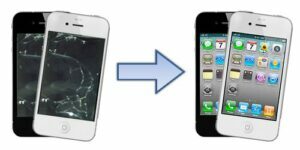 With Fixspot's low iPhone 4s repair prices, getting your iPhone 4s fixed is super easy - and it won't break the bank. If you bring your broken iPhone 4s into an Apple store to get repaired, chances are they'll tell you to replace it with a newer iPhone model. This is unnecessary and expensive - especially if you are already happy with your iPhone 4s. If you're satisfied with the iPhone 4s, why replace it? Don't listen to Apple - get your iPhone 4s repaired. Our prices are so low, theres no reason not to. Compared to the price of shelling out over $1,000 for a new iPhone, the choice is easy. Check out our iPhone 4s repair prices table to your left. We are proud to offer the lowest iPhone 4 repair prices in all of Melbourne. If you need further information on our iPhone 4s repairs Melbourne CBD, please don't hesitate to contact us.